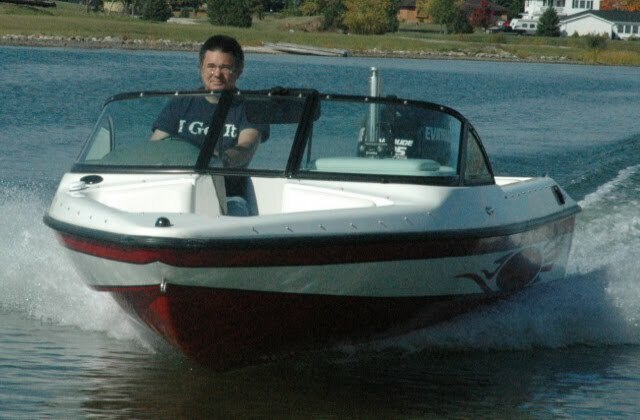 This was the same boat used for testing the 90 hp E-Tec Motor. The 115 hp Evinrude E-Tec is a 4 cylinder two stroke motor weighing 369 lbs. This motor is pretty quiet and seems to be very fuel efficient. I had the motor installed with a pair of transom shims to give the driver more usable trim range. The transom shims give the driver additional control allowing fine tuning of the boat and motor combination on the water. 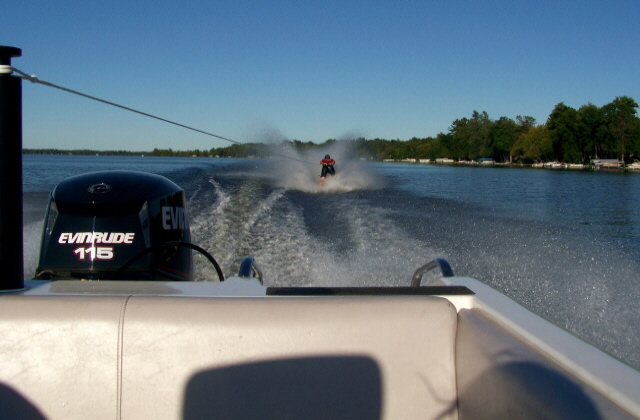 The boat wake size increases and decreases by trimming the motor. The boat speed also changes when the trim is moved up and down. The gauges in the dash included a Livorsi GPS Speedometer. The 115 motor is not as tall as the 90 hp motor. This motor weighs 49 lbs more than the 90 hp E-Tec Motor. The Evinrude motor is very smooth and fairly quiet, very quiet at idle. I ran a variety of speeds with several props and the motor held them well. It was hard to get the boat above 44 mph on the GPS no matter what prop was on the boat. I tried a whole bunch of them and it would appear that the 115 does not have enough horsepower to turn the taller props at the RPMs to get higher top speeds. The wake was small at all speeds with the light weight motor. Remember I'm used to having a 150 on the 17.6 models. A 150 weighs 418 lbs. which is 49 lbs more than the 115 hp E-Tec Motor. The prop was a three blade aluminum 17 pitch. The combination had good acceleration and speed holding. My 7 year old was along for the initial speed testing. The speeds did not change much even with a six people in the boat. The boat and motor combination was very good for all types of skiing. Speed holding was very solid with good acceleration pulling a single water skier up from deep water. The barefoot skiing pictures were taken with four people in the boat, three adults and one child. The ropes were 75’ in length. Pulling the two barefoot skiers out of deep water with one skier on a flip turn ski and the other on a slalom ski along with the four people in the boat was pretty slow but it did pull them up! The back barefooter weighed 165 lbs. and the other footer weighed 215 lbs. The two footers were skiing at 40 to 42 mph together. They each did some one foot barefooting going forward and backwards. They did not do any one foot while skiing together. I pulled both footers deep water several times but not at the same time. The boat and motor combination was very easy to drive pulling the skiers no matter what they did. I'd like to test a 17 pitch stainless steel prop but I did not have one available at the time. What is going on in the water ski boat world.